Defending champions Mumbai Indians Sunday failed to make the playoffs of the Indian Premier League after Rishabh Pant’s blazing half-century set up a 11-run consolation win for the Delhi Daredevils. 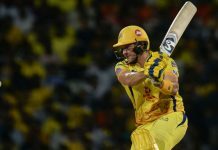 Chasing 175 for victory, the Mumbai batting faltered against the Delhi spinners to be bowled out for 163 in their final league encounter of the cash-rich Twenty20 tournament. Opener Evin Lewis of the West Indies topscored with 48 while Australia’s Ben Cutting made a valiant 20-ball 37. Nepal sensation Sandeep Lamichhane, veteran leg-spinner Amit Mishra and medium-pace bowler Harshal Patel claimed three wickets each. The Rohit Sharma-led Mumbai — winners in 2013, 2015 and 2017 — suffered their eighth loss in 14 matches, giving Rajasthan Royals and Kings XI Punjab a chance to make the final four. Delhi still finished at the bottom of the eight-team table, but wicketkeeper-batsman Pant made an impact by leading the batting chart with 684 runs this season. His 44-ball 64 at Delhi’s Feroz Shah Kotla, including four fours and four sixes, helped the home side post 174-4 after electing to bat first. Royals are close to booking the fourth playoff spot after ending the league stage with their seventh win on Saturday. Punjab need a big win against Chennai Super Kings in the final league game on Sunday to edge out Royals. Table-toppers Sunrisers Hyderabad, Chennai and Kolkata Knight Riders are already in the playoffs which begin Tuesday with the first qualifier in Mumbai. The IPL final is on May 27 with four million dollars going to the winner.